The event included five panel discussions on investing in ecosystem services, irrigation projects, reuse of wastewater in agriculture, and collaborative methodologies for water conservation, among other topics. IICA’s session at the Forum included the presentation of two case studies as well as five panel discussions. Brasilia, 21 March 2018 (IICA). With the aim of presenting good practices and innovative actions for improving water management and conservation in rural areas of the Americas, the Inter-American Institute for Cooperation on Agriculture (IICA) facilitated a session entitled “Water for Food Safety and Rural Development in the Americas: current issues and opportunities” at the World Water Forum. The session incorporated the activities of the Regional Process Commission of the 8th World Water Forum, of which IICA is a member. “In a context characterized by uncertainty and water scarcity, IICA is making headway in the search for solutions through international cooperation projects with different partners. For instance, as part of the Interaguas program, we are conducting studies to guarantee the safety of dams, control water and energy loss, foster energy efficiency, and adapt water for agriculture. We are also implementing water desalination projects in semiarid regions,” stated Gertjan Beekman, Coordinator of the Natural Resources, Environmental Management and Adaptation to Climate Change technical area at the IICA Delegation in Brazil. Beekman, who coordinated the session, underscored the importance of institutional and network coordination among sectors involved, to ensure that work undertaken is successful. IICA’s session at the Forum included the presentation of two case studies as well as five panel discussions on the social impact of using desalination units in small rural communities; investing in ecosystem services; irrigation projects; reuse of wastewater in agriculture; and collaborative methodologies for water conservation. Diana Rojas presented the first case study, which examines a Global Water Program initiative of the Swiss Agency for Development and Cooperation (SDC), carried out in Colombia, Peru and Chile, and soon to be implemented in Brazil and Mexico. The initiative seeks to involve the private sector in water management in order to reduce risks and negative impacts. The second case study discussed was the Semear Internacional program, a partnership between IICA and the International Fund for Agricultural Development (IFAD). Fabiana Viterbo, Coordinator of the Semear program, addressed the importance of knowledge management geared toward water sustainability in rural areas. Viterbo presented the document “Semeando Saberes,” which was published with support from IICA. The publication presents 19 good practices and innovations, seven of which focus on rational water use, that can be replicated in family farming, particularly in semiarid regions. Through the panel discussions, participants at the event learned about different projects that seek to expand the availability of water in various regions of the Americas. Three initiatives in which IICA participates were presented, including the Fresh Water Program (PAD), developed by the Ministry of the Environment (MMA) of Brazil. Renato Saraiva, Coordinator of the PAD program, stated that the project has already assisted 200,000 people by installing desalination units in remote rural communities. “Brazil’s northeastern semiarid region is one of the most vulnerable areas in Brazil. Through joint management by the federal government, states and municipalities, as well as active participation by the communities, we have already installed more than 500 systems,” stated Saraiva, who explained that the units operate by means of a reverse osmosis system, a rapidly advancing technology. The Fresh Water Program provides access to at least 10 liters of drinking water per person per day in the serviced areas. Specialists in charge of the session. Erin Raser, Food Security Specialist at IICA, addressed the difficulties and risks afflicting agriculture in Central America and the Caribbean, emphasizing the need for sharing good water management practices to make agricultural production more resistant to climate change. Close to 80% of farmers in Central America are family farmers who play a critical role in maintaining food security in the region, which has been affected by many natural disasters. In 2015 and 2016, for instance, hurricanes and droughts destroyed 75% of Central American crops. “We are not just talking about sharing resources like water, but also about sharing data and information in particular. IICA can make broad contributions in this regard, given the fact that it has delegations in 34 countries of the Americas,” stated Raser. 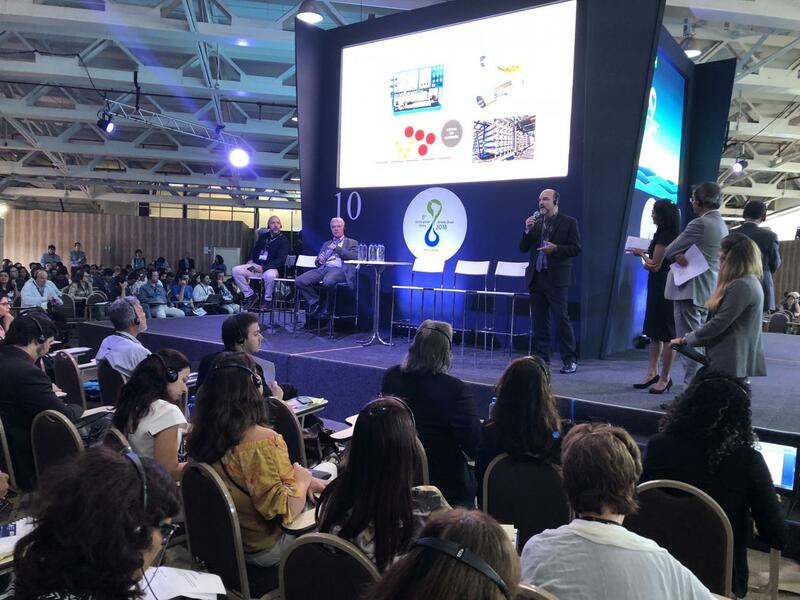 Specialist Ernani Ciríaco presented the technical cooperation project entitled “Reuse of Treated Sanitary Effluent,” developed by the IICA Delegation in Brazil together with the Ministry of Cities of Brazil, within the framework of the Interaguas Program. Ciríaco explained that the initiative reflects the integration of urban and rural policies, for the benefit of rural communities. The objective of the study is to propose an action plan aimed at instituting a policy for the reuse of treated sanitary effluent in Brazil, highlighting its potential uses in agriculture and industry and recommending funding models and/or tariff subsidies. IICA will continue to participate in the 8th World Water Forum, and will showcase its projects at the SDG Planet event at the Brasilia Planetarium, which will be open to the public.